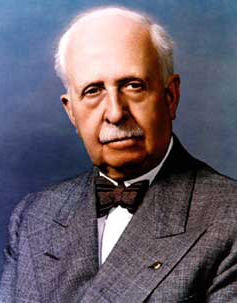 Today in Masonic History James Cash "J.C." Penney, Jr. passes away in 1971. James Cash "J.C." Penney, Jr. was an American businessman and entrepreneur. Penney was born on a small farm outside of Hamilton, Missouri on September 16th, 1875. His father was a farmer and Baptist minister. When Penney was approaching his thirteenth birthday, his father insisted that Penney pay for his own clothing. When Penney graduated from Hamilton High School he planned to go to college and study to be a lawyer. His father would pass away before his graduation, which forced Penney to take a job as a store clerk to help support the family. In 1898, due to health problems, Penney moved west to Colorado. There he would start working for a chain of stores called the Golden Rules stores. The two owners were impressed with Penney and offered him a share of the next two stores they opened, as long as Penney was responsible for opening them. He invested $2,000 into the stores. He would eventually open a third store. In 1907, the two partners who had opened the door for Penney dissolved their partnership. Penney negotiated, successfully, to retain the three stores he had opened. By 1912, there were 34 stores across the Rocky Mountain States. In 1913, he moved the company headquarters to Utah and incorporated them under the name J.C. Penney Company. In 1916 he started expanding the company East of the Mississippi. By 1929, Penney had over 1,400 stores nationwide. Prior to the stock market crash, Penney and a business partner had invested heavily in Florida real estate. They opened Penney Farms and it was the star to Foremost Dairy Products, Inc. The stock market crash of 1929 left Penney's personal fortune in ruin. He at one point in time had to borrow against his life insurance in order to make the payroll for the company. All of this took a toll on Penney's health and he, eventually, checked himself in to a sanitarium. It was in the sanitarium that he became a born again Christian after hearing the hymn "God Will Take Care of You" during a service in the hospital's chapel. Even after relinquishing the day to day operational control of the company, Penney visited stores regularly. In 1940, while visiting a store in Des Moines, Iowa he taught a young Sam Walton (Walmart and Sam's Club) how to wrap packages with a minimum amount of paper and ribbon. He remained the chairman of the board until 1946 and an honorary chairman until his passing. Along with the stores, Penney was involved in other community related efforts. He was involved in the founding of the University of Miami. After the Great Depression, Penney teamed with Thomas Watson (IBM), radio personality Arthur Godfrey and inspirational speaker Vincent Peale to start 40Plus an organization that helps employ managers and executives. In 1954, Penney founded the James C. Penney Foundation. The fund, now called the Penney Family Fund and is no longer affiliated with the J. C. Penney chain of stores, gives money in Oregon, California and Washington state for work that creates advances in the fields of human rights, community social, political, economic empowerment, government accountability, and environmental sustainability. Penney passed away on February 12, 1971. He passed away after suffering a broken hip from a fall and later a heart attack, neither of which he ever fully recovered from. Penney was a member of Wasatch Lodge No. 1 in Salt Lake City, Utah. He was initiated on April 18th, 1911. He was a member of both the Scottish Rite and the York Rite. On October 16th, 1945 he was coroneted a 33° mason. In 1958 he received the Gold Distinguished Service Award by the General Grand Chapter, Royal Arch Masons in Kansas City, Missouri.